4 important factors everyone should learn about common skin allergies, plus other helpful information. Skin allergies are considered some of the most annoying conditions of their kind. Since they leave visible marks on the skin, they can be very difficult to cope with. A lot of people undergo therapy to learn how to deal with the stress implications of having to life with such a condition. Just as with other types of allergies, a skin allergy is when the body has an abnormal reaction to an ingredient that would normally be harmless. When a person suffers from a skin allergy, the immune system identifies the harmful ingredient (which is known as an “allergen”) and overreacts in an attempt to block it. There are a lot of different types of skin allergies, each with its own characteristics and specific treatment options. This is the most common one of all, and it’s especially present among children, although adults can develop this condition as well. Also known as “atopic dermatitis”, eczema can also be caused by a faulty gene that’s passed on from parent to child. This condition is present when the skin can’t withhold a sufficient amount of moisture, so it dries out excessively. It is often linked to other health problems, such as food allergies, hay fever, or asthma. Allergic contact dermatitis is another form of skin allergy, which is triggered when the body comes in direct contact with what the immune system identifies as an allergen. Contact can be either direct (by touching the allergen) or indirect (by touching another item that previously came in contact with the allergen). Some skin allergies take the form of hives, which are visible inflammation spots on the skin. Also known as “urticaria”, hives are triggered when the body’s immune system releases histamine. As part of the chain reaction, the blood vessels begin to leak, thus causing swelling in the skin. Urticaria can be both acute and chronic. The former kind has very specific triggers, that range from food to exercise. Chronic urticaria, on the other hand, doesn’t have specific triggers, which make it harder to spot. What are the skin allergy symptoms? Since all of these skin conditions are different, they also present different symptoms. Atopic dermatitis, for example, becomes visible with dry, red, and itchy skin. In some cases, eczema marks are accompanied by a leak of fluid, which is a sign of infection. Hives are easy to recognize because they are white and red bumps that can appear anywhere on the surface of the skin. Angioedema, which is a very specific form or urticaria, is generally present on the lips, cheeks, and around the eyes. 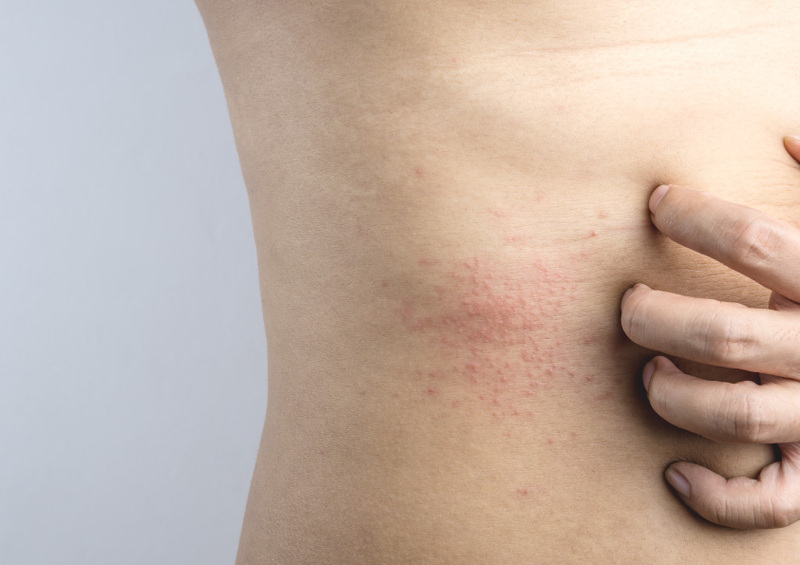 People who suffer from acute urticaria will only have the welts for a few days or weeks, while those suffering from chronic hives can have these signs for months, or even years. In some scenarios, people who suffer from contact dermatitis may touch a substance that triggers an allergic reaction, and have no means to reach a doctor or a hospital in the nearby future. Consequently, it’s important to know some forms of first aid treatment at home. The first step requires washing the affected area with plenty of water. Next, you can turn to over-the-counter medication that relieves itching. If a child is the one who suffers from an allergy, it’s very important to purchase medication that’s appropriate for their age. To calm the irritated skin, you can look for an ointment that contains zinc oxide. For rashes caused by coming in contact with poison ivy, calamine lotion can soothe some of the discomfort. Oral antihistamines are also helpful in preventing itches, as well as hydrocortisone creams. Pay attention, as these creams are not suitable for children under the age of two, unless they were prescribed by a doctor. Benadryl or Claritin are recommended in case the itching interferes with normal daily activities, but be aware that some of them may cause sleepiness. There are also more natural ways to treat the symptoms of a skin allergy. Compresses with cold water can help when a rash becomes severely irritating and uncomfortable. Simply wet the compress and gently pat the affected area. Afterwards, apply a skin moisturizer. Damp dressing can also help, just make sure you use a soft piece of clothing or fabric (something like cotton). Once area has been cleaned, let it air dry. Wearing tight clothes can also cause discomfort for people who suffer from a form of skin allergy. When the clothes are too tight, the skin isn’t able to breathe comfortably, and some fabrics may intensify the itchy sensation. In the end, the presence of an epinephrine auto-injection inside the house is crucial. It’s the most urgent mean to combat anaphylactic shocks, and no person that suffers from allergies should live without one. People who suffer from skin allergies have to see either a dermatologist or an allergist. In mild cases, where people don’t show any drastic symptoms or know exactly what the trigger is an how to handle the situation, a doctor’s visit isn’t mandatory (at least not on a regular basis). Either of these specialists can perform tests to determine what caused your allergy, and provide suitable treatment or prescription medication. Patch tests are performed in such situations, to see if there is a specific product you came in contact with that may have caused the allergy. The patches are actually samples of products suspected as triggers. This test will determine if a patient has an allergic reaction to different types of allergens. The test typically lasts 48 hours, time in which the person being tested must avoid getting that portion of their skin wet. In certain cases, a doctor may take a sample of the patient’s skin, to perform a biopsy. People who suffer from skin allergies have a lot more means of soothing the effects of a rash or irritation compared to those who have other types of allergies. It’s important to see a doctor at first, even if the skin irritation has mild effects. Because of their high sensitivity, skin allergy sufferers should avoid prolonged sun exposure, but also be aware that their reaction could be caused by a food allergy.